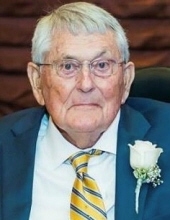 Joseph J. Stala, 88, of Flemington, NJ, passed away peacefully on Thursday, February 7, 2019 at Hunterdon Medical Center. He was born in Somerville, NJ, and he lived 78 years in Branchburg before moving 10 years ago to Flemington. Mr. Stala was a proud worker for the Branchburg Township DPW for 52 years before his retirement in 2000. Joseph enjoyed traveling with his family, was an avid baseball fan, and enjoyed spending quality time with his family, especially his grandchildren. He is preceded in death by his beloved parents, Barbara Zawatwski and John Stala; and his loving wife of 55 years, Ruth Hand Stala (2006). Surviving are his two loving daughters, Barbara and husband Frank Jadach of Old Bridge, NJ, and Ruth and husband Dave Mulligan of Flemington, NJ; his dear brother, Peter of Neshanic Station; his wonderful sister, Katherine Lorenzi or Neshanic Station, NJ; and nine cherished grandchildren Jerry, Corina, Debbie, Jon, Nicole, Rich, David, Matt and Katie. Viewing will be held Tuesday, February 12, 2019 from 2-4 and 6-9pm at the Branchburg Funeral Home 910 US Highway 202 South, Branchburg, NJ 08876. Funeral services will start with a prayer at 9:45am at the funeral home followed by a 10:30am funeral liturgy at St. Magdalen’s R.C. Church in Flemington. Entombment will follow at St. Magdalen’s Cemetery in Flemington, NJ. To send flowers or a remembrance gift to the family of Joseph J. Stala, please visit our Tribute Store. "Email Address" would like to share the life celebration of Joseph J. Stala. Click on the "link" to go to share a favorite memory or leave a condolence message for the family.